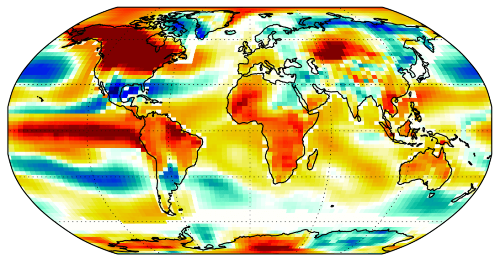 How Does El Nino Warm The Entire Globe? How is it that an event predominantly characterized by a warm blob of water in the tropical eastern Pacific can have such a pervasive effect on global land temperatures? Consider the following: in your home you have a heater that warms all of the rooms. If you increase the heater’s temperature by one degree you would expect that the rest of your home also warms a bit, but probably less than one degree, and that the most remote rooms would warm least of all. Surprisingly, this is not what happens when you warm the tropical oceans in our climate system. This heater heats up all the “rooms” by more than itself. It turns out that if we were to warm all of the oceans on Earth by 1C, the land would, as a direct result, warm by 1.5C. On average, the land always warms more than the ocean. The key difference here is that when you warm the tropical oceans you also release additional water vapor into the atmosphere by evaporation from the oceans’ surface. This entry was posted in Earth Science, Extreme Weather, Uncategorized and tagged atmosphere, el nino, global temperatures, ocean currents. Bookmark the permalink.